Yardley Equine is a small independent company primarily providing a safe and friendly horse transport service. I am fully insured, DEFRA registered, hold City & Guilds NPTC Level 2 Transport of Horses by Road Certificate and I am compliant in all legal requirements for the transportation of your horse. If you have loading issues with your horse I will happily spend as much time as it takes with you and your horse to overcome his/her problem. Time is irrelevant, patience is in abundance and violence is out of the question. Visit my clipping page for details on my clipping services. All types of clip can be tailored to your individual requests, but be warned... 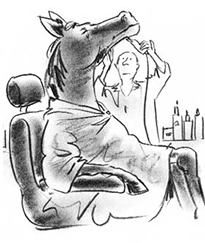 I'm an ex-barber so if your horse asks for tram lines he'll get them! Further services I provide involve holiday livery for your horses in their home environment. I am happy to include looking after any cats, rabbits or other small animals who prefer to stay at home rather than jetting off with you to bask on a beach. I will accomodate dogs wherever possible but for this service I prefer them to holiday with me in my home. This is at the discrection of my own animals. Please do not hestitate to ask if there is an equine service that you require that is not mentioned on this site. I will always try to help you if I can. I am a lover of all animals and will endeavor to assist you with any of your animals requirements from dog walking to caring for your family rabbit. Please feel free to contact me with your requirements. All types of clip can be tailored to your individual requests, but be warned... I'm an ex-barber so if your horse asks for tram lines he'll get them! Cut the cost of annual boosters. Transport fees save money on vet call out charges.